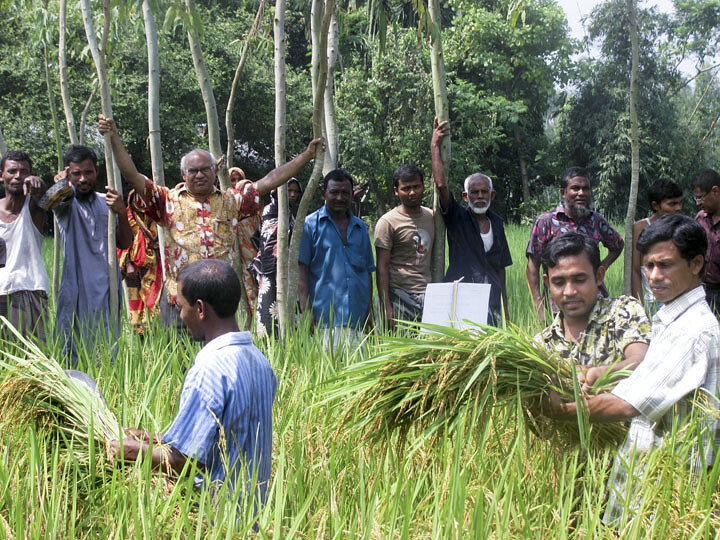 A Farmers’ Field Day on BRRI dhan56, an early-maturing and short-duration variety, was held at Rajarhat in Kurigram District on 26 September 2012. Seventy-three farmers came and exchanged practical tips and shared experiences with one another. It is noteworthy that no other rice variety matured in September in the area. BRRI dhan56 posted a yield of 4.4 tons per hectare. The farmers were thrilled to get this much yield from a short-duration variety. BRRI dhan56 matures in 109 days. The early harvest of rice provides a longer window for the subsequent non-rice crops, such as mustard and mungbean. Farmers previously harvested only two crops a year; with BRRI dhan, they now have the option of a third one, and an opportunity to increase their farm income. The field day was organized by the Rangpur Hub of the Cereal Systems Initiative for South Asia in Bangladesh.